An academic institution that has always supported and encouraged innovations, IIIT-H went a step further when in 2008 it opened up a Centre for Innovation and Entrepreneurship (CIE). The idea was to formally support startups with the end goal of commercializing cutting edge technologies developed in its research centres. In 2012, the IIIT-Foundation opened its doors to startups outside the institute as well, following recognition by the Department of Science and Technology (DST), Govt of India. The foundation has supported over 200 startups till date and has made seed investments in 30 of them. The portfolio startups have gone on to raise 50 crores INR external funding from various sources. From embracing startups across all sectors, the foundation has turned its focus towards startups working on deep learning technologies and machine intelligence. Currently there are over 12 deep tech startups working on computer vision, natural languages and speech recognition, artificial intelligence, robotics, AR/VR, and the gaming domain. On the occasion of the 10th anniversary of its supportive journey, CIE puts the spotlight on 10 of its most promising deep tech startups. “CIE since its inception in 2008, has been supporting technology based startups. At one point of time CIE was home to 100 plus startups. It pivoted to focus primarily on deep-technology and launched India’s first deep-technology focused accelerator program Avishkar. Through this program, CIE has discovered in just 2 years, 12 deep-tech startups and has enabled overall 20 plus startups engaging with IIITH research labs. All the listed 10 startups are futuristic, unique and many of them are engaged with IIIT Hyderabad research centres,” says Lakshmi Misra, Head, Incubation and Community at CIE.
Docturnal Imagine diagnosing pulmonary TB just by listening to and interpreting a cough. Well, this startup aims to disrupt the healthcare space by leveraging machine learning and AI. Fabulyst Online trial room feedback gets a makeover with this sophisticated AI-assisted tech rolled out by Fabulyst. Forget merely seeing what a particular outfit looks like on you. With itsunique hyper-personalized search experience, this virtual trial room assistant tailors recommendations based on skin tone, and body type. With advanced filter options, you can narrow down apparel choices based on occasions and style types too – formal, bohemian, beach wear, and so on. What originally started off as an app in the B2C space is now a B2B proprietory platform, boasting of Flipkart and Myntra among its customers. Speaking about how their approach is entirely novel, co-founder of Fabulyst, Komal Prajapati says, “We differentiate ourselves using aspirational consumer attributes, such as, ‘how can I look slimmer, taller, etc’ which directly map to unmet user queries”. 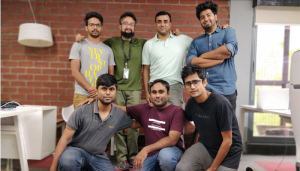 With its unique insights on population and retargetting of users, Fabulyst now plans to foray into the online International retail space. Manjeera Digital Systems To handle the inherent complexities of futuristic devices in an AI-driven world, it is becoming increasingly clear that we are going to have to rely ever more on sophisticated hardware that can support and scale up to deliver usable performance needed for small devices to big servers. Traditional processors do not have the abilities to process such big data typically needed for neural network processing. Therefore it is not just traditional chip makers but also tech giants that are after high performance computing. NicheAI Founded a year ago, NicheAI is a startup that develops highly accurate, practical applications for deep learning enabled computer vision problems. From sectors such as roadways, where their algorithms were used in fraud detection at toll plazas, to auto insurance where the start up has been assisting insurance companies analyse claims images and videos to disburse insurance claims, the dynamic team truly believes the future of AI is on edge and not on cloud. Project Grace, named after the famous computer scientist Grace Hopper is their flapship product. Soham Acharya, the co-founder of NicheAI, explains it as a hardware and machine learning library agnostic framework, leveraging principles of machine generated machine learning for large scale deployment and highly reliable maintenance of deep learning projects. NicheAI is currently working with IIIT Labs to take some of their projects out of Lab into production using Grace. “Edge deployment or hosting sophisticated software on local hardware, is what we’re talking about. We want to make it extremely simple to deploy and maintain that,” affirms Soham. Onward Assist From a patient-engagement platform born in response to a personal situation, this startup is now positioning itself first as a predictive analytics platform, with a primary focus on Oncology. Onward Assist is building automated diagnostic tools based on computer vision that serve as “assistants” to pathologists, providing valuable insights which in turn will be passed on to the oncologists. Another area where it plans on building dashboards is in the risk scoring of patients. On the basis of lab tests, genetic tests, biomarkers and so on, OnwardAssist calculates the risk score for cancer patients. This score is the deciding factor for the oncologist on the line of treatment for the patient. It is even used to predict patient response. The computational pathology-based tool has received great feedback from the medical community. They are in a couple of research partnerships in the areas of Histopathology as well as cancer treatment response prediction. “We have three partnerships in place, with a few more institutes showing an interest in working with us. Our research partners will use the platform, validate it and then, we take it to the market”, says Dinesh Koka, one of the founders of the CIE-incubated startup. While they may have already received validation from clinicians, the focus now will be on narrowing down on and refining these tools. DreamVu How do you build a camera to perceive reality like a human (eye)? With its core R&D in computational photography and computer vision, IIIT-Hyderabad spin off, DreamVu aims to address this question by creating immersive experiences with its smart omni-directional stereo camera. Rohan Bhatial, COO of DreamVu explains that it’s not just hardware but also a software platform for capturing VR/AR content or enabling efficient autonomy. This has great potential and applications in autonomous vehicles, drones, robotics, AR/VR cameras and smart invasive systems. DreamVu’s solution is based on innovative optics, geometry and hardware that are optimized for capturing data with ease. Their optical geometry are based on designs inspired by human binocular vision and perception. Just as the human eye sees all around and can perceive depth, DreamVu’s optics and hardware can too. Rohan says that the uniqueness of DreamVu’s products lies in the fact that the data captured by the omni stereo camera reduces the load on computation during processing by significant margins. It also scores over the current technology in that it is adaptable and scalable, due to the sheer simplicity of capturing and processing of data. With 8 patents filed so far, the startup plans to start testing their VR camera in the coming quarter with production houses and VR content creators in US and Europe. They are also in deep discussions with multiple fortune 500 companies in the automotive sector. MerkleTree Labs Blockchain technology and cyptocurrency products are all the buzz lately. Recognizing the need for a secure platform to share high profile data without getting breached or tampered with, MerkleTree Labs is a blockchain technology startup that helps develop various blockchain applications to suit different business needs. The team says that apart from just providing secure data, blockchain has become the new internet revolution with various use cases across industries. Some of the popular services they offer are smart contracts where the digitized contractual terms implement automatically once all terms are met, tokenization where sensitive information such as personally identifiable information (PII), protected health information (PHI), and credit card numbers are replaced with an incomprehensible set of characters called tokens, creation of private and secure digital identities and more. What is unique about MerkleTree Labs is its highly encrypted messaging layer. “Messaging has become the main stream to share the data between individuals and groups and we use multiple social services for this. Here we are developing a messaging layer which is completely decentralized, peer-to-peer, end-to-end encrypted. The user will be left with complete controls with whom to share the data or how to share it,” says their Block Chain Lead, Ram Sailendra Varma. Imaginate An open liver surgery using Augmented Reality – LivAR. An immersive environment that allows a soldier-trainee to view and interact with a mixed rendered environment of real world with virtual world through viewing hardware – ShootAR. A virtual fitting room – Dressy. An AR based guide in the form of an app (available on Google PlayStore) that guides users around the Quli Qutub Shahi tombs, currently adopted by The Aga Khan Foundation, Switzerland – HeritageAR. Hoisting the Indian flag on Independence Day using Mixed Reality technology through a HoloLens. These are just some of the customizable, innovative visualization products and services of this startup across fields of retail, defence, entertainment and healthcare sectors that enhance the consumer’s experience of reality. Their USP is technology based on Augmented Reality (AR), Virtual Reality (VR) and Mixed Reality (MR). Hemanth Satyanarayana, CEO of Imaginate, says their aim is to provide realtime, immersive collaboration of 3D data across multiple geographies to reduce lead times in design evolution of physical products. He believes such a real time collaboration of critical 3D medical data could especially revolutionize healthcare. The challenges of non-availability of AR/VR hardware notwithstanding, the company is expanding and currently looking to raise $3 mn in Pre-Series A funding. MyAlly As per the LinkedIn Global Recruiting Trends 2017 Report,the industry average time taken to complete the hiring process for a candidate is 1-2 months. This includes mundane tasks such as scheduling and rescheduling of interviews, constant follow ups, selection of the appropriate interviewer from your pool of interviewers, monitoring candidate progression in the pipeline and so on. Enter Alex. Not just a “smart assistant”, but a “smarter recruiter”. What was primarily a scheduling platform aimed primarily at easing tasks for busy professionals, MyAlly has now evolved to assist recruiters facing the typical challenges of talent acquisition by leveraging AI and machine learning. MyAlly has developed solutions to co-ordinate the end-to-end candidate selection process from interviews, to management of candidates through the pipeline and even automating the process of candidate evaluation. Not only does this reduce time and make the entire process faster, it creates transparency, providing dashboards and customizable reports for leadership so they can grab metrics around hiring speed, productivity,and so on at a glance. RevOs AI-assisted and driven cars are not new. But here’s an AI-enabled IoT platform for 2 and 3-wheelers. With its intelligent hardware and software solution, RevOs aims to make these vehicles “smart” in terms of vehicle analysis, control and visualization. Their custom hardware monitors and controls components like the Motor Controller, Battery Management System, and Electric Fuel Injectors. With dashboards and apps for data analytics, and diagnostics, it makes for smooth interactions between customers, suppliers and distributors. It has added benefits for suppliers with streamlining of production, delivery and assembly of components, with the ultimate goal of increased sales through insights on component-tracking and performance.